No one knows your pet better than you do! You live with your pet day in and day out. You get a feel for when something is wrong. On the other hand, your vet only spends a few minutes seeing your pet. You know what is normal for your pet's eyes. If your pet seems to have more "eye matter" than normal or something is bothering its eyes take it the the vet. If you don't believe what your vet has told you, you have every right to go see another one. One of the vets I saw for a second opinion did a thorough eye exam (my vet did not). This vet told me that eye surgery may not correct his problem...that there may be some other underlying problem (read Gabby's story). During this time, I was putting Natural Tears (artificial tears) and Lacri-Lube in his eyes because they were dry and irritated. This also helped get rid of his eye secretions. 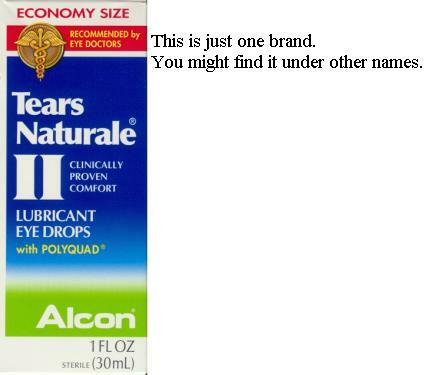 Natural Tears (artificial tears) - may be sold by other brand names. Don't use products that remove redness (this might prevent healing). All this is is saline water with some other ingredients to help keep the eye moist. It also helps remove mucus from your pet's eye. After about one-half hour the mucus will come out of the inner corner of your pet's eye where it can be safely removed with a clean towel. You can be pretty liberal with these eye drops At the hospital, some patients I cared for had this stuff prescribed ever hour. Here is a helpful web page for applying eye drops/ointments. Lacri-Lube - is a petroleum jelly product. Please do not put regular petroleum jelly in your pets eye. Ask your pharmacist for Lacri-Lube ointment (also may be sold by other brand names). This product serves the same purpose as artificial tears except it is an ointment intended for nighttime. Intended for nighttime because it will last longer and will cause blurry vision. I still use these products on my dog because of his droopy eye-lids. I don't think his eye-lids are bad enough for surgery but these products help keep his eyes moist and to help remove discharge. Gabby had another reoccurrence of malaise and droopy eyes. I took him to my vet's office and saw a different vet. The vet said he had uveitis (inflammation of the uvea) and possibly a prostate infection. The vet said a dog's eyes get droopy when they are sick. He prescribed steroid eye drops for his left eye and antibiotics for his prostate. Within one day gabby's eyes were back to normal and he was back to his hyperactive-self. Place about 1/4 teaspoon of peanut butter on the very tip of the spoon (this makes it easier for the dog to get at). Place the spoon upside-down as shown to make it easier for the dog to get at. Give your dog the peanut butter. This is the easiest way I've found to give my cocker spaniel his pills. Within a few licks he's swallows the pill and I let him finish the peanut butter to make sure it's gone down. If it's a big pill I use more peanut butter. My mom couldn't get her dog to take a pill but I tried this method and the dog took the pill without any fuss.